With my new cookbook well under way and keeping me very busy, I’ve lined up some fellow bloggers to do guest posts for me two Saturdays a month. 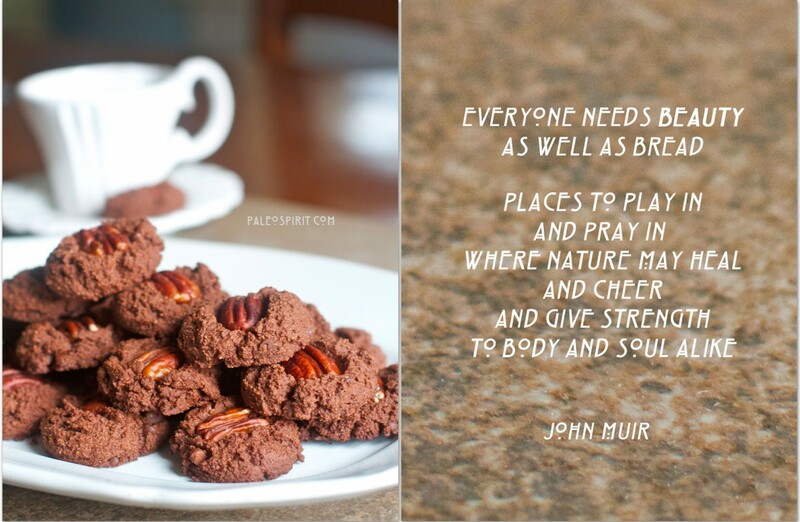 My autoimmune condition is heavily fueled by stress, so in an effort to stay healthy, these friends will help relieve some of the stress and keep recipes still coming your way! Today we have Lea from Paleo Spirit. Lea's shares stories of her 2 boys, tips on health & fitness, and Paleo recipes on her site which is all accompanied with beautiful photography. 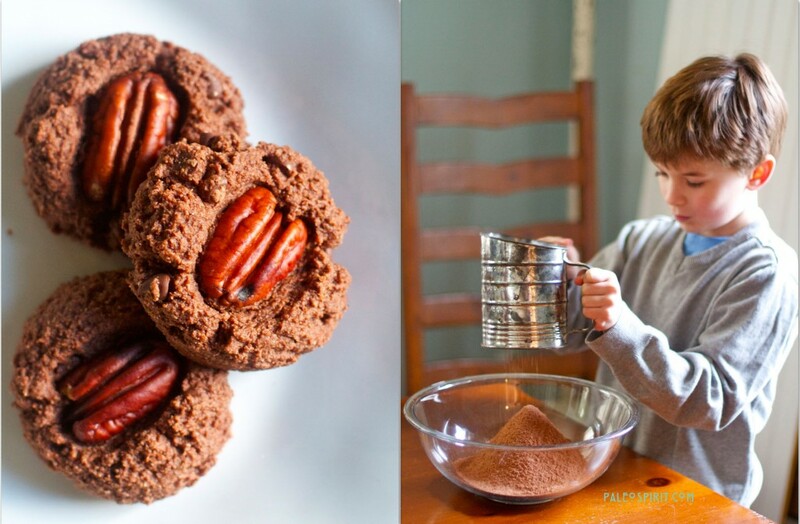 Today she’s guest-posting on Against All Grain to share a vegan double chocolate pecan cookie with you. Welcome Lea! Most of us love to eat. We crave delicious food, hopefully we enjoy healthful food, and we appreciate food that is visually appealing. We intuitively understand the importance of the full sensory experience when something beautiful is incorporated into our everyday lives. But have you ever considered how important beauty is to health? Just as we need food, water and oxygen to live, so also do we need beauty in our lives to survive and thrive. Exposing ourselves to beauty on a daily basis helps maintain good mental, emotional and spiritual health and well-being. Beauty brings consolation in sorrow, affirmation in joy and the sense that life is worth living. I urge you to make sure you find something beautiful to appreciate every day and make it part of your routine. It does not have to take a lot of time and effort because beauty is all around us no matter what the circumstances. Stop and smell a flower, take a photo of something simple and make it beautiful, listen to wild birds singing for five minutes, read a story of heroism, look at a beautiful piece of art or listen to a musical masterpiece – anything to get your RDA (recommended daily allowance) of beauty. For our family, cooking is one of our great pleasures. My children and I enjoy spending time together making and enjoying delicious, healthful (and often beautiful!) foods. 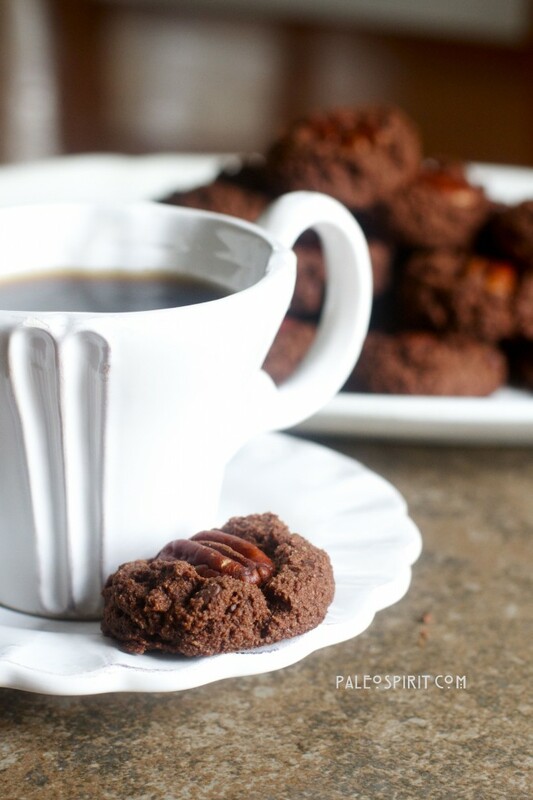 The following recipe for Grain-free Double Chocolate Pecan Cookies is a recent favorite. Lea Valle is a wife and mother with a passion for food and fitness. 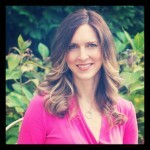 Her blog Paleo Spirit is dedicated to exploring ways of achieving fitness for the whole person – Mind, Body and Soul. She happened upon the paleo way of eating after searching for answers to debilitating health symptoms rooted in undiagnosed Celiac disease. Lea manages working full time and eating “paleo” while making sure she takes time to “stop and smell the roses”. Place the pecan halves on a baking sheet and toast in the preheated oven for about 10 minutes. Combine remaining dry ingredients (except chocolate chips) in a large bowl. Mix wet ingredients into dry ingredients and stir in the chocolate chips. Place one toasted pecan half on top of the cookie dough ball and press down until it is somewhat imbedded in the dough. Bake the cookies for 10-12 minutes. Let them cool on the pan for a few minutes before removing so they set – otherwise they will be too soft and may fall apart.